The world is full of bitter men. Men who apportion blame for their failures to their women. The modern man has perfected the BLAME GAME. Many don’t own up theirs mistakes. They don’t own up thier failures and shortcomings. They blame the sun for not shining and when it shines, they blame it for their scorched skin. Just like Adam! Why was Adam afraid? Why did he hide? If he had done the right thing, he couldn’t have hidden. He was the one who was given the instructions by God. He exactly knew what to do in the garden of Eden. But when the serpent came to deceive the wife, he was THERE but said or did nothing. When he realized that they had sinned and were naked, he hid, they hid. Just like many of us today. We cave in when we err. We hide in shame and retract to our man caves and cocoons. We hide from the reality and submerge ourselves in other things that will make us feel comfortable and at ease. Adam had a choice but he decided to take the easier route. He blamed the wife for something that was entirely his responsibility. He didn’t protect her neither did he offer leadership at the opportune time. He was mum. He didn’t stand his ground to defend his God given convictions. He BLAMED HIS WIFE. “The woman whom you gave me……..” he said. What a lame statement coming from the head of the family. It was a very sad state of affairs. He could have done better. And I believe that we, men, can do better too. Nowadays you ask a man why he has not succeeded, he says it’s the wife who has not supported his dream and vision. Blame game. Ask him why he is not a good father to his children and he will blame the wife for not creating a conducive environment for him to have time with them. Ask him why he’s cheating and he will blame the wife for changing after one or a few pregnancies. Ask him why he does not take good care of his wellbeing and he shall blame the wife for not motivating him. Ask him why he’s not effective in his place of work and he will put the blame on his wife for not giving him time to recharge and decompress. I pose to you this question…. WHAT ROLE HAVE YOU PLAYED IN THESE? Could it be your self-centrednesss has brought you to where you are? Has it ever occurred to you that maybe your egotistical perspective has birthed what you are? Have you placed yourself at the centre of the universe? Are you selfish? Are you DISPLACING your emotional shortcomings to the ‘soft target’ (read as your wife)? What is the description of love? Here we go: Love suffers long and is kind; love does not envy; love does not parade itself, is not puffed up; does not behave rudely, does not seek its own, is not provoked, thinks no evil; does not rejoice in iniquity, but rejoices in the truth; bears all things, believes all things, hopes all things, endures all things. Every man should deliberately learn to love his wife and live with her in understanding. Sometimes living in understanding with your wife is not an easy task. I can attest to that. But marriage is not for the weak and the cowards. It’s not for the double minded man. Do not be bitter to your wife. This is an instruction from God. She’s a gift from God and an equal heir of the grace of God. When you are bitter to her, her kisses will no longer be sweet, her charms will no longer be enticing. Her beauty will no longer be alluring. Her food will no longer be mouth watering. Her voice will cease to be sweet. And you shall be one unhappy man. Learn to handle your failures and disappointments by sharing them with your wife. Communicate and after you have done that, communicate more. Be open to each other. Be naked to one another. Make her your best friend. Your BFF. Do not blame her of your failures. For heaven sake she’s your help her and not your punching bag! Take the Lead. 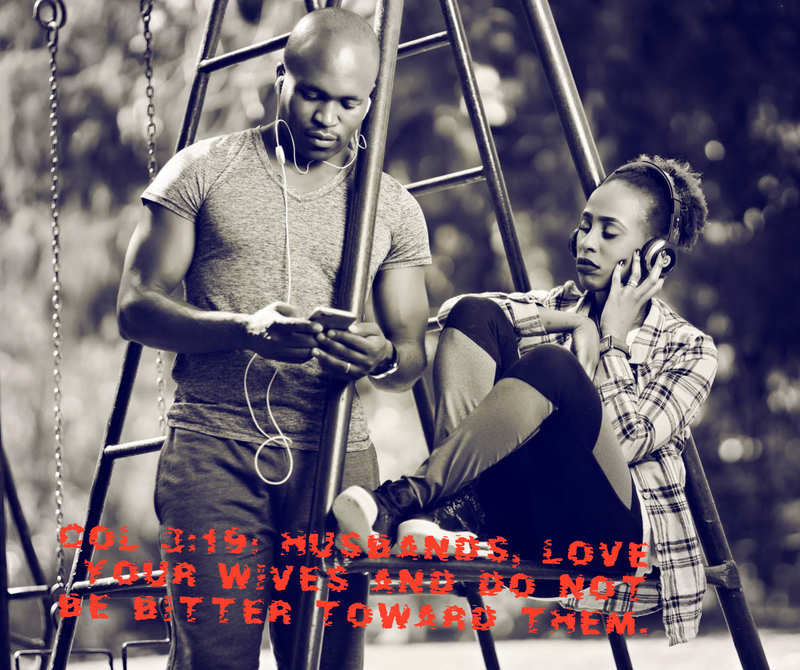 Be the husband you were created to be! Previous PostTHERE IS NO CONDEMNATION IN CHRIST JESUS! Next PostMONDAY TIDBIT - The focal point of relationships - Christ. Turns out to be one of those we can’t miss these days. Ooh! Modern man doing this. This young generation dudes. I guess commitment. And my best if all, men between age 15 & 30 are so lost. And we go on about it. Even to quote Adam. And what is that husband you quoted. The created one. And while at it, talk about nature and nurture. Going into the 6th Gerald.! Hope that answers your question(s)!God bless you and keep being encouraged!